The TV series Agents of SHIELD debuted this week and a lot of comics fans have been discussing it a lot. From trying to figure out how Agent Coulson is alive despite being killed in The Avengers movie, to the more basic "is this any good on its own merits", to ratings, to Easter Eggs, and just about everything else. I haven't seen the show yet; I have no great desire to, but I probably will see it sooner or later just because it's on Hulu for free. But right now, I can't really comment on any of that. But I will comment on this one screen shot, which I've only seen one person bring up at all so far. During the opening credits of the show, after the actors and producers and such have been listed, there's a big ol' creator credit to Stan Lee and Jack Kirby. 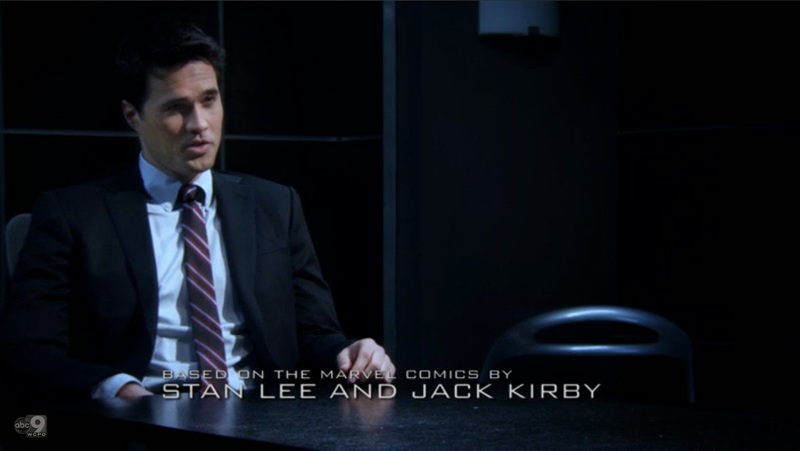 Let me restate that: Jack Kirby gets name-checked in the OPENING credits of Agents of SHIELD. Now, granted, this doesn't necessarily translate as (well-deserved and loooooong overdue) money going to his estate, but do you know how many concepts he's created that were adapted for TV and film that wouldn't even say he worked on them? The only series/movie I can think of offhand that gave Jack a decent, regular credit up front is the short-lived and fairly obscure Silver Surfer cartoon from 1998. Some of the movies have given Jack a creator credit or "special thanks" at the end credits, but who really pays attention to those? I mean, sure, people hang around for them now since Marvel started regularly adding epilogues to the movies after the credit sequences, but unless there's something going on on-screen, I think people largely turn to each other and chat about what they just watched. By putting Jack's name up front of every episode (one presumes the basic credits won't change throughout the season) people are more likely to see it. And, as much as I hate to say it, the association with Stan here is going to help. "Stan Lee" they've heard of. They know him (incorrectly) as the singular creator of Spider-Man, the Hulk, the X-Men, the Fantastic Four, etc. By pairing Jack's name with Stan's -- while perhaps a little misleading as it assumes roughly equal credit with a bit more going to Stan since his name is first -- it brings a level of notoriety to Jack that he probably wouldn't have by himself. Had the credit read "Based on the characters created by Jack Kirby", people might be curious enough to look up who this guy is, but those that don't would be left with zero impression. They might assume Jack's just some new writer they haven't heard of before, maybe a protege of Joss Whedon or something. But bringing in Stan's name, it points to their creative partnership and puts some level of context to Jack's name. I still don't know that a simple "based on" credit is sufficient for all the work Jack did for Marvel, but it is a considerable amount more than what Marvel has historically given to him. Very strange to think that giving creators appropriate credits for their work was something that didn't really happen until Marvel was bought by Disney, a company infamous for its very long history of giving one man credit for an entire company's output.